I’m a music head. Perhaps not as much as I used to be (grumpy old man syndrome), but the benefit of working at COSIGN Magazine is being in an environment where I can discover music before the masses do. In a world of dying/dead mom-and-pop music stores and a saturation of hustle-over-art musicians, we can actually share our musical finds and play a role in turning people on to quality music. (And no, we’re not feeling ourselves when I say that.) Not only do we shine a light on the music, but also on the path these artists took to get here and the views and opinions they have from being in the belly of the beast. 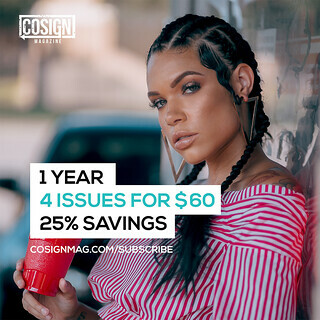 So while COSIGN Magazine is not a music publication, Issue 17 is our music issue. On one cover, we have the two-time Grammy Award-winning production duo Play-N-Skillz and on the other is former American Idol contestant and soon-to-blow singer Kassy Levels. Between the covers, we approached music from more than just the ͞wanna hear it, here it goes͟ angle, and talked to a variety of people that make their living in and around music. We have radio personality J-Kruz, DJ and DFW-music advocate bemyfriend, Deep Ellum music venue RBC and record store Josey Records, which if you are reading this issue on the day of its release, you may be standing in RIGHT NOW! (That’s where our issue release event is being held.) Not to mention that the team went to Austin in March for SXSW, had a blast, saw people perform, met others, etc. The usual thing you do at Southby, and we included pictures. © 2017 COSIGN Media Group, LLC ALL RIGHTS RESERVED.